President Trump’s visit to the Mississippi Civil rights Museum recently added controversy to the opening of the museum. JACKSON, MS — President Donald Trump’s 40-minute visit to the Museum of Mississippi History and Mississippi Civil Rights Museum concluded a days-long controversy over his presence at an event that commemorated a milestone in the state’s difficult racial history. Civil rights icon John Lewis, Jackson Mayor Chokwe Lumumba, and Rep. Bennie Thompson, as well as other noteworthy Mississippians, said they would boycott the event after the president accepted the invitation earlier. They claimed the president did not support the spirit of the new institution and would only distract from the ceremony. The growing criticism of his visit led the Mississippi Department of Archives and History and the White House to create a separate private program for Trump as a compromise, and the public event occurred without the president. In the end, Trump, who was delayed due to the snow dusting the region, addressed approximately 200 people after a brief tour of the museums and appeared to largely stick to a prepared speech that lasted no more than 10 minutes. The president spoke largely about the life of civil rights leader Medgar Evers, who was assassinated in his driveway by white supremacist Byron De La Beckwith in 1963 and provided praise to the state and its civil rights legacy. Trump then went on to congratulate those involved in the creation of the museums. “This is an incredible tribute to not just the state of Mississippi — a state that I love, a state where I’ve had great success — this is a tribute to the nation at the highest level,” he said, before wrapping up his short visit and departing for Mar-a-Lago. Shortly thereafter, local leaders gathered outside and together cut a long red ribbon separating the two museums. A boon or cause to boycott? While the president’s visit infused the event with political controversy, some Republicans offered positive takes on his presence. “This is a huge day for the state of Mississippi and the fact that the president came here is a significant economic benefit to us,” Mississippi Secretary of State Delbert Hosemann said. “The president put it on the map better than any marketing firm could have,” he added. Some black Mississippi leaders also chose to attend Trump’s address, despite the controversy. “I felt the need to be here to honor the sacrifices made by a number of people featured in the museum, and it was my responsibility to be here for them because they’re no longer with us,” Mississippi Rep. Alyce Clarke of Jackson told Mississippi Today. Earlier in the day, the president’s visit sparked a counter-rally at the Smith Robertson Museum and Cultural Center, less than a mile away from the new museums. “It is my appreciation for the Mississippi martyrs who are not here, the names both known and unknown, that will not allow me, that will not allow many of us standing today, to share a stage with the president,” Lumumba said. “Mr. President, we don’t need you to tell us in Mississippi what the civil rights movement was about,” he added. NAACP President Derrick Johnson reflected on the pivotal role Mississippi played during the civil rights movement. He said it is because of the sacrifices of leaders like Evers, that the NAACP refused to stand for a “photo opportunity” with Trump. Amos Brown, a Jackson native who is now the head of the San Francisco chapter of the NAACP, echoed Johnson’s call for a boycott. “Since one Donald Trump made it to that White House, we have not experienced concord, we have not experienced harmony — but we have experienced the jangling discords of hate, division, misogamy and all the –isms that have divided this nation,” he said. Johnson vowed that civil rights leaders across the country would return to the museum at a later date to hold their own ceremony. Meanwhile, others chose to openly protest Trump’s presence. Approximately 100 protesters chanted “Dump Trump” and “No hate in our state” and held up signs a few blocks from where Trump spoke. But, overall, local leaders said the entire controversy has been somewhat surreal and indicated an abnormal time in history. 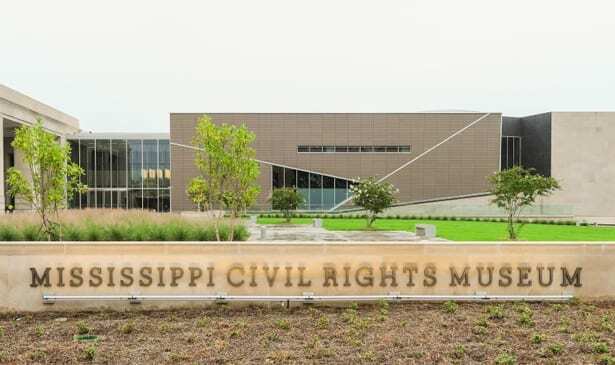 The idea to build a civil rights museum in Mississippi first took root in the early 2000s, before gaining significant traction in 2011 when the state made a financial commitment of $90 million to the museum. “This is a reminder that freedom is not free and that people fought and bled and died for the civil liberties that we enjoy today. That’s why this museum’s existence is so necessary and Mississippi should be commended for appropriating $90 million for this museum,” said Mike Espy, a former Mississippi congressman and secretary of agriculture, as well as a longtime member of the state’s committee to establish the museum. An additional $18 million was raised privately in support of the museum, Espy said. The money all contributes to the opening of the two museums, both of which are run by the Mississippi Department of Archives and History. “There was really a desire to create a space where Mississippians can come together, examine their history and move forward as one,” said Julia Marks Young, who led the Archives and Records Services Division at the Mississippi Department of Archives and History from 2005 until 2016 and helped pull together the museum’s deep archival work. The museum earned high marks from some those who have seen it. Peyton Prospere, the former Mississippi treasurer, openly wiped tears from his eyes outside the museum after Trump’s visit.